• 1250 sqft , 3 bath , 5 bdrm bi-level – FOR SALE CAD415,000 . Perfect for the family! 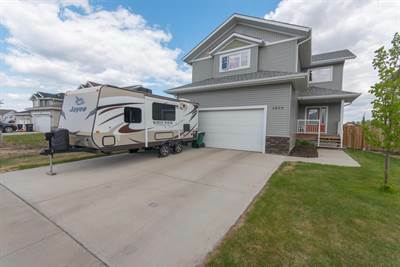 Located in a quiet cut-de-sac, this 3+2 bedroom, 3 bathroom bi-level home has 1250 sq ft on each level! The kitchen layout affords a tonne of counter space to harness your inner chef, 3 good sized bedrooms on the main, and a bright inviting living room. The basement is the space you are going to love! It has 2 more bedrooms, 1 bathroom with jacuzzi tub, an AWESOME family room and the best part — in floor heating! Turn it off to keep it cool in the summer and turn it on for warm and toasty in the winter. Perfect for your movie nights and just to hang out. The pie lot has lots of space for your kids pool or whatever you have in mind. Check it out today. • 2131 sqft , 4 bath , 1 half bath , 4 bdrm 2 story – FOR SALE CAD449,888 . Welcome to this beautiful 3+1 bedroom, 3 1/2 bath custom built home in Gibbons around the corner from Landing Trail School! The open main floor layout is perfect for those who like to entertain featuring a huge kitchen with island, corner pantry and more. 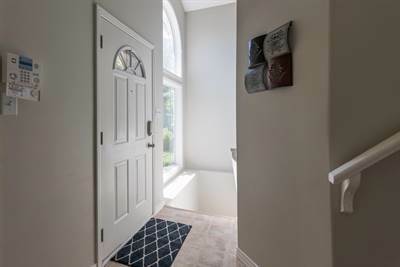 Upstairs you will find a gorgeous bonus room big enough for about whatever you can dream up, a master bedroom with 5 pc ensuite and walk in closet, and two generous bedrooms. In the basement you will find 9′ ceilings, a large, bright family room, bedroom and full bathroom. The cork flooring here keeps your toes warm. This home was custom built, by the builder for himself. With ICF foundation, 2″ of insulation under the concrete floor slab, this home is well insulated and energy efficient. The oversized double garage is 24x24x11′ high. It is fully insulated and big enough to store your toys on a lift and park underneath. Every product used was well though out. The quality is evident through and through. Check it out today! • 2200 sqft , 2 bath , 1 half bath , 2 bdrm 2 story – FOR SALE CAD680,000 . 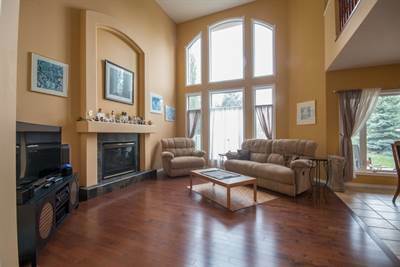 Custom built by Canyon Springs & backing onto Lewis Estates Golf Course, this executive 2 storey home was designed for active couple with some well thought out features. The main floor, featuring gorgeous new hardwood, is the perfect layout for entertaining with an open floor plan that flows right out to the 17×22 ft deck. The huge gourmet kitchen is the ideal place to harness your inner chef featuring large centre island and abundant storage and counter space. The den, located next to the front door, is a bright, welcoming work space for your home office. Walk up the open stringer stair case to a bonus room that leads out to a 17×20 balcony. Watch the summer storms move in from the west with an unobstructed view over the golf course. The master bedroom is a getaway of its own with fireplace, ensuite bath featuring mood tub (with waterfall that warms the water and coloured lights), huge walk-in closet with quality built-ins that leads to the laundry room — a very logical progression. The laundry room connects as well to a second bathroom with steam shower. Down the hall, you will find an additional room — perfect for your guest room or whatever you imagine. The basement is huge and unspoiled ready for your own ideas. It could feature a couple more bedrooms family room and so much more. The space is there for whatever you dream. The 24’x30′ heated garage has been drywalled, freshly mudded and painted. It will make you feel very spoiled! There is ample space for storage while still parking your vehicles. The home was built on a premium Lewis Estates lot with a centre island park out front, and backing onto the 9th hole. Landscape was designed and installed by Earthworm Landscaping and features numerous perennials and shrubs. Sitting on the deck is a peaceful place to be, in rain or shine. Come check out this home today! The 28’x35′ heated garage has been drywalled, freshly mudded and painted. It will make you feel very spoiled! There is ample space for storage while still parking your vehicles.